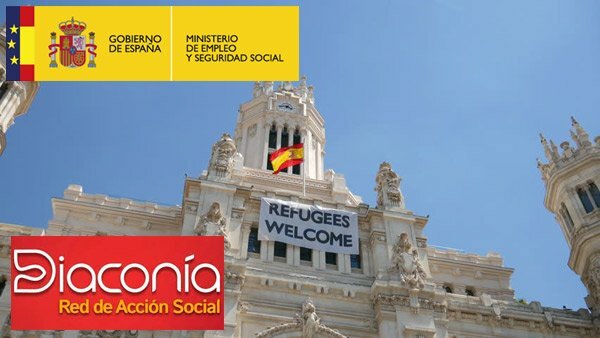 The Ministry of Employment and Social Security in Spain has recognised the projects of our member in Spain, Diaconia Espana, and granted state funds for its projects in the area of support for migrants and refugees. Financial support has been granted for Diaconia Espana’s (Diaconia Spain) projects “A new home”, aimed at the creation and maintenance of reception devices and the development of integration itineraries; and the “Create Your Future” project, providing training and support in the search for employment in Spain, co-financed by the European Social Fund. In total, € 3,126,172 has been awarded for the projects, during which Diaconía Espana plans on working closely with our other member in Spain La Iglesia Evangèlica Española (the Spanish Evangelical Church); the New Life Evangelical Association of Santander; And the Social Aid Association. Given the support received, our member organisation will be even more capable of fulfilling its aims of being an organisation bringing about real social action and supporting those in need. In Spain, collaboration between non-governmental entities such as Diaconía Espana is fundamental for the Spanish State to fulfill its humanitarian obligations towards refugees and their commitments in this regard. Diaconia Espana feels that this commitment demonstrates how they are ready to “shoulder the burden” and do their part in giving the most dignified and effective reception to refugees in their country. You can hear more about Diaconia Espana’s projects on their website.